What exactly does the Parasympathetic Nervous System do? The parasympathetic nervous system is half of the autonomic nervous system [ANS]. Think of the ANS as the body’s autopilot. It is tasked with connecting to smooth muscle (as found in the gastrointestinal tract, for example), cardiac muscle, and glands. The Parasympathetic Nervous System controls “rest and digest” functions, while the sympathetic nervous system activates the body’s “fight or flight” response. In the modern world, most people’s fight-or-flight system is overly active, while the poor “rest and digest” functions get put on permanent hold. When the fight-or-flight system is over-active nothing else works as it should. There are a couple different ways to restore balance between the body’s different systems. I use Energy Medicine techniques, including the Black Pearl exercise, to calm down the body’s fight-or-flight system. The Radial Appliance repairs the energy body, thereby helping to reactivate the rest-and-digest nerves. Get a series of FREE reports about balancing the Sympathetic and Parasympathetic nervous systems by putting your email address in the box below. Diagram of efferent sympathetic nervous system. 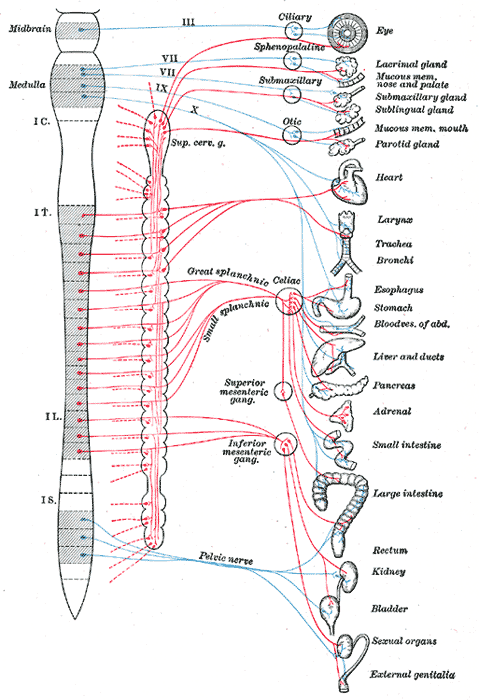 In this picture from the 1918 edition of Gray’s Anatomy of the Human Body, the parasympathetic nervous system’s connections to the brain and spinal cord are in blue, and the sympathetic nervous system’s connections are in red. The parasympathetic nerves are connected to the brain via cranial nerves (III, VII, IX, X) or the spinal nerves that emerge from the sacral vertebrae (S2, S3, S4). Edgar Cayce says that the Radial Appliance is the best way to “reactivate” the Parasympathetic Nervous System. It does this by balancing the energy body. When this happens, everything works better. Sleep improves, digestion improves, metabolism improves, etc.